Club Penguin Cheats by Mimo777 Club Penguin Cheats by Mimo777: Interview with Club Penguin's Billybob! I found this pretty cool Interview with Lane Merrifield, or as we know him, Club Penguin's Billybob! He got the idea of using penguins because, "penguins live in groups and have to work together in order to get things done, to be safe and thrive." He also said, penguins are easy to animate! LOL. So did you already know all this about Billybob? What would be the ONE question that you would like to ask Billybob?! Try Mimo's Virtual Lounge! Pretty cool! I know this is off subject, but I found a glitch! If you dance with a shirt from the snow forts and a guitar you can still play the guitar with that shirt on! i would ask him what inspired him to make club penguin?? And if he would be ok with me making a new catalog :) lol jk but it would be fun I would love to ask him if we could have a rainbow hoodie!! that would be cool!! Penguins are easy to animate? LOL. Yeah, probably right! hey anonymous, it isnt a glitch club penguin said that we can do that now. i dont remember where i read it tho. o and my question 2 ask billybob? i would ask, "hey billybob can u make sum really cool things for non-members 2?" What's your favourite ice cream topping? A rainbow hoodie would make an awesome treasure book item! Yup, it mentions that in the newspaper. But it's very cool isn't it!! That's a pretty good interveiw i think. He sounds like a nice bloke :) Well, I don't know what my one question would be... Oh yeah and when are you gonna announce the winners of the caption contest? have you already and i've just not realized? Yes, it is down a lot!! I got my black electric guitar for 975 AGES ago. now they're so cheap!! Yeah that would be a great question to billybob!!! Billybob could give sum really cool stuff to non members to be fair!! Cool! I wonder if non-member items make sounds too, like the maracas. I was going to write: 'Whats your favourite ice cream.' I don't put toppings on my ice cream. Well, this time he said he FOUND the interview, not that he actually interviewed billybob. But once he actually got to meet him. Pretty awesome huh? Can non-members have their own catalogue? The stuff wouldn't be as awesome as the members catalogue but at least we could buy stuff. Also, could non-members play card-jitsu fire or if Ice or Water are coming then those too? This is off the subject! Im trying to make a membership but it says: Declined! this has been for days and I want to be a member...NOW! Off subject, so I'm on Frozen, on the roof, and this person comes by and says she is Aunt Arctic, she is dressed just like Aunt Arctic, and is saying things Aunt Arctic would say, but her user was Hannah00000. I don't know if any of you were there with me, but it was WEIRD!! *Writes Rainbow Hoodie on Christmas list* There, It might be the middle of summer for me, but I'm always prepared! I want a Rainbow Hoodie! Mimo, I was wondering, we voted for the color Aqua last year during Music Jam '09, will we vote for another color this year? Off topic, sorry, but I had an idea! They should make a section of the catalog called Smile! It could be a special thing where you pick a design and some colors, and you can make braces for your penguin! You can change them, as long as you buy the package, and then there is a special button, with a picture of a smile, and it says, Open or Closed? And you can open your penguin's mouth! Best of all, it's for everyone! Even non-members too! I've got the idea train moving quickly, just sitting here on Frozen waiting for Candence! Hmmmmmmmmmm my question would be.... Do you like cheese and bacon? I had a dream about working at CP the other day, it was awesome, and I was in charge of ideas, I have plenty!! Just check my posts from a couple back, I have ideas for postcards, pins, backgrounds, special CP mascots, basically everything! I agree what inspired him??? That dounds like a good idea to me even though I'm a member! Whoa, that's not a bad idea, Ashley! What's your favorite Club Penguin party? P.S: I'm starting to Mod again! 'sup mimo, my Q for Billybob is... "What time do u go on?" ~ Peace out from 26blusnow! "Why did you name your pengguin Billybob?" The reason why non-members dont get nothing is because Club penguin needs the money to keep runnin. If every one had a member and didn't pay then its more likely that Club penguin will be no more. its so cool to see Billybob as an actual person... and to see what he looks like! "How many peeps work at/for club penguin?" "What does a regular work day look like for you?" penguins are easy to dress up as well! If i got to ask billybob (AKA Lane) it would be if I could be a moderater or if there would be a globle exchange room! and its not just on the snowforts- you can do it in any room!! I saw that the candy apple pin is back in the mine. Not trying to burst you bubble, but if you go to the cheat section of the newspaper, one of the cheats is that now you can play the guitar with a shirt on! That is really cool! Now you can look AND sound stylish on CP! I would ask him "Is it hard getting together club penguin parties?" sorry, that's not a glitch. club penguin made it that way so that penguin don't wonder why they All ways have to be cloth-less to do a special item dance. You probably knew this, but at the mine, there is a statue of herbert! That's not a glitch: if you read the newspaper, Club Penguin now added that with the Music Jam t-shirts. Yeah, Billybob is a pretty cool guy. I'm not sure if Mimo already posted the Caption Contest wieners - he might soon, though. P.S: No, I do not watch Formula 1. I haven't heard of it till now. of course, idk the real answer, but here is the answer i WANT to hear. YES!!! at least, hopefully. i remember the lime green party way back in the day, when the dojo was just the plain room that looked like a wooden box with a door. :) ANYWAY, i really hope we will... a really cool color would be silver or gold or something metallic like that... or you can mix colors- make your own penguin's paint!! Mimo who is Billy Bob??? I think that i would ask why CP doesnt have an arena igloo. this is a new dance that cp has allowed. Read the news paper, it says in the secret file. Hello! I have a question for all the mods out there or anyone that might know the answer: How do I get a PERFECT score in Elite Penguin Force test? I have trouble with the hiding part. Anyone know what to do? can we friend your penguin? like rockhopper and cadence and those people? that would be so cool! Ya thats a good Q it would be awesome if we could be on at the same time! But don't you think that Club Penguin is going too far? Non-members could at least have SOME items to buy, and SOME game upgrades, and a lot of other stuff. By the way, don't write: "...non-members don't get NOTHING..." because that means that non-members do get SOMETHING! Awesome! That's no glitch; it's in the "Secret's Revealed" page! They need to do that for all instruments and items! Yup! Mimo gets tons of stuff about CP! This is only the second interview with Billybob I've read/seen! Mimo probably has tons! That's why I check out this site. Haha! You got ripped off by Club Penguin. XD Well, now they have the Blue Electric Guitar! That's SO weird! Try going to Club Penguin support! Or email them and ask! I agree with the catalogue thing! That would be pretty awesome! The only free items for non members are hats, so they could wear other things too! I hope so! I really want some new colors! Mmm..... Cheese and Bacon... I like cheese AND bacon! That's a genius question to ask him. That would be so much better! I hope they do that sometime soon! That's an easy one! I mean, it BILLYBOB! You can't resist that name! Billy+Bob+Billybob! Yea! CP has to do all this stuff everyone hates to keep it going! People say there's too much member stuff, but if there wasn't, there would be no CP at all! Mimo saw this already, but great job! Thanks Flippers! I have been wanting a trade room FOREVER! Penguins could trade items for new items! That would make CP so fun! Great question! I bet it would be pretty hard! CP has a lot of workers though, so it wouldn't be too impossible! We got that in a sneak peek in May! If you didn't see that, then good eye! Haha! He might even tell you, because it only works from his computer. So many ppl hacked his account that he had to make it like that! It's OK! BTW, I looooooooove that show! It's so good! I watched it last night! My fav episode is the Griffin Gang, what's yours? When you founded Club Penguin, did you have a specific child in mind that you were targeting? "Yes, myself and co founder Lance had children of similar ages and, between ourselves and our other co-founder Dave, we had many, many nieces and nephews. We wanted to create a safe, ad-free, online playground for them to play in." Yea, all you have to do is throw a snowball at camera two so it can't see anything. Then drop, duck, and waddle behind the nearest pillar. Nothing can see you now! Comment back if you have any other questions on how to pass that test. 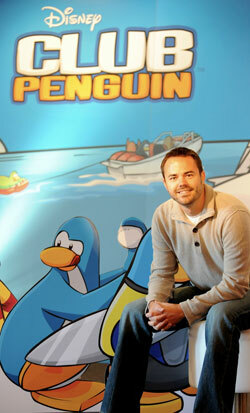 Billybob is one of the original founders of Club Penguin. His real name is Lane Merrifield. for the hiding part, you hide behind one of the cement/gray pillars on each corner of the screen. when i did the test, i hide behind the bottom left one, and im pretty sure it didnt find me. Lane Merrifield's penguin IS Billybob. Rocketsnail use to own pc3 until disney took over. the only thing thats the same is penguins because thats was ROCKETSNAIL started out with. Do you care about us non members? i would ask him what inspired him to make club penguin?? And if he would be ok with me making a new catalog :) lol jk but it would be fun I would love to ask him if we could have a rainbow hoodie!! that would be cool! Yep that would make a great item for non members and members too. Thank you for commenting anonymous! I notied that a while ago. I wonder why it's there! I don't know about Billybob but I love the Music Jams! Billybob probably goes on at random times during the day! Who wouldn't like cheese and bacon?! Billybob is one of the people who helped create Club Penguin. For the hiding part, there is two giant pillars at the bottom of the screen. Hide behind one of those! I was watching a behind the scenes video on YouTube and apparently it's very fun where they work. Yeah, he has a penguin. I think Club Penguin should allow us to give party ideas because kids would like CP a lot better if the ideas actually came from a kid. Yeah. Club Penguin just isn't something these adults work on in their spare time. it's a job for them. Having a Global Exchange room would be so cool! Yeah Mimo is awesome! But, I also seen this interview on other sites! To get 100% on the EPF Test, in the hiding part you have to hide in the lower left pillar, and throw a snowball at camera two. Hey Mimo and everyone. There's a new field op! And Mimo guess what? I beat you to finding it. xD And the microphone you need to find is in the forest. There mimo this time I helped you. LOL! It's true. Your Welcome! OMG!!! mimo- the new field op is out!!!! i just noticed... its at the microphone in the forest, and its the same as the first and the third one!!! UGGG its so easy- why club penguin!!! Can i get credit for this? Hide behind the left column that is closer to the real u and when the camera turns off, throw a snow ball at it!! Hide from camera 1 by going behind one of the grey pillers, and to hide from camera 2 throw a snowball at the camera 2. LOL MIMO!! The new Field OP is out! And it is soo hard! (its at the forest, at the Country stage, near the drums)! I know someone who knows the creator of club penguin cause thats his boss and I had asked if he could tell the creator if he could add to club penguin some new feautres like silly string and showing how many penguins are in each room and some other useful things.I just wanted to tell you that. The dangerous microphone is at the forest!!! I'm sorry this is off the subject, but field op #5 just came out! *Are you really a Billybob? a LOL!! I would never c dat coming,u got a rlly good eye cause mimo didnt even c dat. So i think he would rlly thank u and maybe he will post it so keep an eye on his posts and not only dat just mention ur name. a Thats so true i would be " HEY WHERE YA GET DA HOODIE!" I would love til i get tired or it duh,lol! again dats an AWESOME idea!! No, miniclip didn't make Club Penguin. It was developed by New Horizon Interactive, and was later bought by Club Penguin. You can play Club Penguin on Miniclip, but Miniclip didn't make Club Penguin. Could we forget the members and make everything for everyone? If you check the Club Penguin times in the secret expossed section then you will see that Club Penguin has mentioned this. It's not a glitch really, but thanks for mentioning it, some penguins may have found out this via your comment. Lol! I am guessing you like veggie fajitas! Hmmm... Do you not think that if you asked him what was going to happen it would spoil the fun? I think you are asking if Mimo has posted the latest field op "cheat" If you check you can see Mimo has posted it now. He may have been busy working on it when you went online to do the field op. Same here, It isn't really a proper clearance if the price doesn't drop! Cp stole my coins which in 3 years I've earned. They are liars especially this guy that does not fixes their web problem.